Season 2 recently wound up, and the Meyerists have largely survived another year. Rotten Tomatoes' summary: "In its second season, The Path follows the Meyerist Movement as it tries to make sense of Dr. Meyer's mysterious departure. Tormented by strange visions, Eddie struggles with a new life while Sarah, despite her skepticism of Cal, now stands beside him as Co-Guardian of the Light. When Sarah finally learns of Cal's dark past, she buries the truth for the betterment of the Movement. Cal and Sarah, now closer than ever, strive to atone for their misdeeds while Eddie, confronted with the meaning of his visions, discovers the truth of Dr. Meyer's departure." 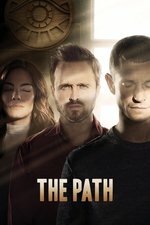 Todd VanDerWerff, Vox: "Hulu's The Path gets even more esoteric — and better — in season 2"
AV Club: "Hulu to remain on The Path for season 3"
This seems to have snuck by: no Fanfare action, and I can't even find season 2 material on A.V. Club. I figured this at least deserved a season post after we talked about individual episodes last year. I still like the show. I see comments about "pacing", which hasn't been an issue for me. The show is character-driven if it's anything at all, and the plot-furthering moments often risk melodrama. It loses its tone sometimes: I didn't like the new character, whose name I can't remember, who hung out with Richard at all: he felt like he got teleported in from a soap. I also would have liked Richard's character to be more rounded; it's great that an actor with a developmental disability gets a significant role, but he is always on the edge of being "generic bad guy with a gleam in his eye" although I think the show intends for him to come across as more nuanced. He gets probably his best treatment in the last episode, and when this happens on TV, well you know what is likely to follow. Another example of "atony" is Michelle getting sprayed in the face with black blood at the end of an episode. The lighter magic realism elements, rare as they are, on the other hand I welcome. Hawk floats, and it's good because it doesn't turn into a plot point. I still think this is one of the better shows around right now, but I can understand if others find it dull or melodramatic. As someone who primarily watches this show for Shirtless Hugh Dancy Moments, I was pretty disappointed in Season 2. -I haaaaaaaate Sarah. With every episode that passed, I haaaaaaaaated her more. -Eddie as the One True Guardian being all conflicted and ambivalent is kind of tiresome and confusing when he swings back and forth between all fiery committed and threatening Cal, and then the next moment is like "whatevs, I'm leaving"
-They didn't really do much with the triangle between Hawk, Hawk's new girlfriend and Hawk's old girlfriend. Not sure what the point was of bringing the old girlfriend back into the mix. -I was surprised with the whole Sean leaving the Movement storyline too. Sean seemed pretty devout during the first season, and he told that story about how awfully his family handled his brother's death, and so I found it unbelievable that he would just be like "ok!" when his family wanted him to come home. -Mary and the baby. So is Cal claiming the baby? It's obviously not Sean's. How much of a player is Mary going to become? Can she really manipulate Cal beyond getting him to buy her a fridge? I finally finished this season, and I dunno, I'm just kind of meh about the whole show. I really like the main triumvirate of actors, but I just can't bring myself to care that much about the plot. I think part of the problem is that the show goes out of its way to show Meyerism as specifically not a cult, but rather a loose amalgamation of anodyne New Age platitudes. There's nothing wrong with that, but I guess I was hoping for more of either some spooky psychic/supernatural stuff, or some exploration about the various ways such an organization winds up going over to the dark side, and the coercive power of a social group with a distinct sense of being outside the mainstream culture. Instead, they explicitly walk back the spooky stuff by talking about how the members who saw the initial event were on drugs, and they focus specifically on the corruption of Cal and Sarah, but not really on the group dynamics of how it affects the movement at large. Which, again, that's ok but it could have been set at a non-profit theater arts group or something and it would be basically the same story, so I guess I feel like they're wasting the potential of their setting.